Get a glimpse of Mumbais’ charisma on Canvas. City exhibition inspired by buses, trains and even gate way of India. The City of dreams or the City That Never Sleeps, these are clichés often used to describe Mumbai. Despite the crowed street, countless slum dwellers and increasing crime rate, the city has an unusual enigma and has manage to inspire artists to paint its vitality and strength on canvas. Mumbai by Ananta Mandal is yet another exhibition that portrays the cities’ undying charisma. Mandal, a young artist who has several international and national awards to his credit, has through his exhibition, captured Mumbai beautifully, portraying its strength, vitality, transparency and vulnerability. His canvases draw inspirations from the cities’ shimmering skyline and tall building, urban transport, monsoon, busy streets scenes and fishermens’ boats all of which give Mumbai its unique flavor. 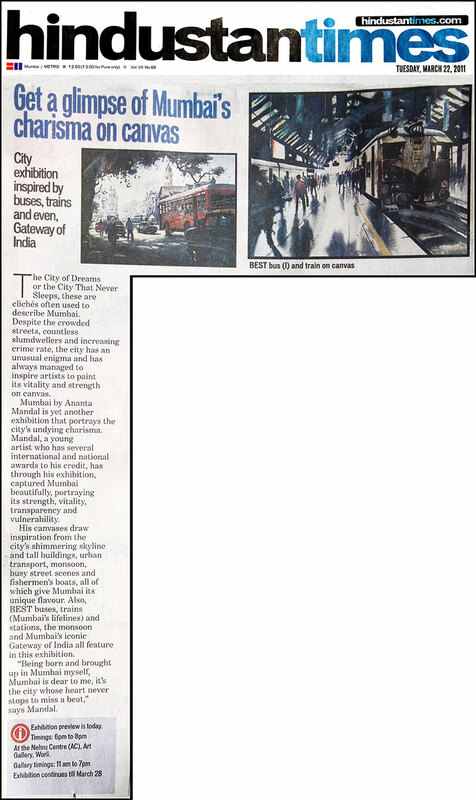 Also, BEST buses, trains, (Mumbai’s lifelines) and stations, the monsoon and Mumbai’s iconic gateway of India of all feature in this exhibition. “Being born and brought up in Mumbai myself Mumbai is dear to me, it’s the city whose heart never stops to miss a beat,” says Mandal.